Effective August 1, 2011 Westview’s garbage pick-up day will be switched to Wednesday’s. 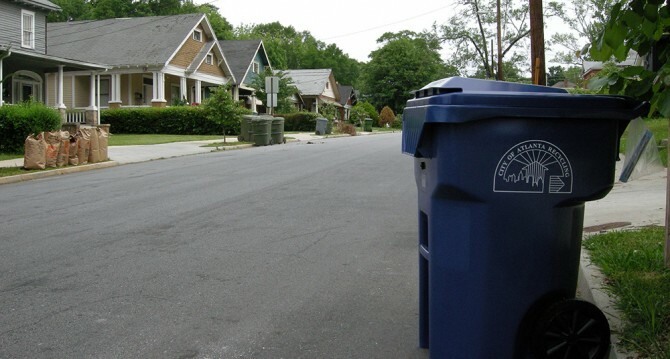 Household garbage, recycling, and yard trimmings will continue to be collected weekly. Details: The City of Atlanta, in partnership with Rehrig Pacific, a container company and service provider along with sponsor Coca-Cola Enterprises, celebrate the launch of an exciting new recycling rewards pilot program powered by RecycleBank® and coming to Atlanta residents. The event will host city officials, Rehrig Pacific, Coca-Cola and RecycleBank representatives, as well as feature automated recycling truck demonstrations. Refreshments will be provided by Coca-Cola. Representatives from all organizations will be on hand to answer questions and explain how the program works. Already a success in 21 states and in the United Kingdom, the new recycling rewards program, powered by RecycleBank®, allows households to earn Points redeemable at local and national retailers in exchange for recycling. Read more about the RecycleBank program on their website, www.RecycleBank.com. Beginning the week of September 14, the Department of Public Works will resume weekly collection of household garbage, recycling and yard waste.